Your baby’s health depends on you. Talk to your doctor about any drugs you are taking, including prescription pills. Any drug, including prescription drugs, that a woman takes during pregnancy can harm both her and her baby. That is why it is imperative for women to tell their doctors about all the drugs they are taking or have taken during pregnancy. The use of drugs during pregnancy can pose a risk to the health of the baby, including premature birth, developmental problems and other serious life-long health issues. Many of these babies are also born with Neonatal Abstinence Syndrome (NAS) and suffer withdrawal symptoms such as fever, seizures, and extreme sensitivity to sound and light. On average, babies born with NAS stay in the hospital for 16 days longer than healthy babies because of the detoxification process. This does not have to be your baby. Pregnant women, or women who are of child-bearing age, can greatly reduce risk to their babies health by finding the right help for drug addiction. The resources on this website offer care for women as well as information for providers and families to help babies start life happy and healthy. 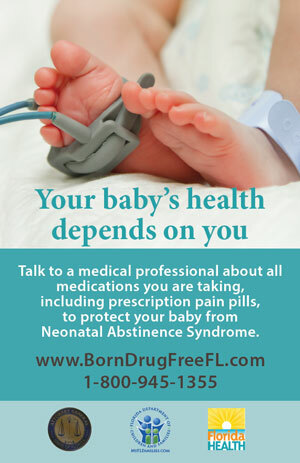 "Born Drug Free Florida" is an initiative by the Florida Department of Children and Families, Florida Office of the Attorney General and the Florida Department of Health to raise awareness about babies being born exposed to prescription drugs. The campaign educates expectant mothers about the importance of discussing prescription drug abuse with their doctors and to offer assistance to the women. Attorney General Pam Bondi worked with the Florida Legislature during the 2012 legislative session to create a Statewide Task Force on Prescription Drug Abuse and Newborns. She chaired the task force, which was charged with examining the scope of the problem of Neonatal Abstinence Syndrome, the costs associated with caring for babies with NAS, the long-term effects of NAS, and strategies for preventing prescription drug abuse by expectant mothers. This initiative is one of the Prescription Drug Abuse and Newborns Task Force’s recommendations intended to end NAS in Florida’s newborns. The Department of Children and Families took the lead role in executing this educational initiative. It is important to talk to a medical professional about all the medications you are taking, including prescription pain pills. By talking to a medical professional before the pregnancy, you can reduce the chances of your baby being born with Neonatal Abstinence Syndrome (NAS). Babies born with NAS suffer from withdrawal symptoms such as tremors, seizures, abdominal pain, incessant crying, and rapid breathing. In many cases, doctors and nurses give these newborns methadone, the same drug used to treat heroin addicts, and morphine to ease their constant pain. If you are currently pregnant, there is still time to help the baby. The baby’s exposure to the drugs decreases the earlier a medical professional is involved. The severity and duration of drug withdrawal the baby experiences after birth can be significantly decreased. If you do not currently see a medical practitioner, check out our map or call our Helpline at 1-800-945-1355 for medical contacts in your area. There are a variety of reasons you may be taking prescription medications. However, these medications may have an impact on the development of your baby. Whether you take this medication with a prescription or for other reasons, it is important to be aware of the potential impact. If you are pregnant, or may become pregnant, your baby’s health is dependent on yours. When you use a drug or drink alcohol, it significantly impacts how your baby develops in the womb. It is not too late. Contact your medical practitioner or view our map or call our helpline in order to give your baby a healthy start. C Have you ever felt you ought to cut down on your drinking or drug use? A Have people annoyed you by criticizing your drinking or drug use? G Have you ever felt bad or guilty about your drinking or drug use? E Eye-opener: Have you ever had a drink or drug first thing in the morning to steady your nerves or get rid of a hangover? The CAGE can identify alcohol problems over the lifetime. Two positive responses are considered a positive test and indicate further assessment is warranted. A score of 2 or more is considered positive. Affirmative answers to questions A, C, or E = 1 point each. Reporting tolerance to more than two drinks (the T question) = 2 points. Sockol RJ, et al. (1989) The T-ACE questions: Practical prenatal detection of risk drinking. AM Journal of Obstetrics and Gynecology. 160(4). Chang G. (2001) Alcohol-Screening Instruments for Pregnant Women. Alcohol Research and Health, 25 (3), 204–209. Most women stop using prescription pain medications, illegal drugs and alcohol during pregnancy. However, some may not know how dangerous continuing these drugs can be for their unborn baby. People use substances for a variety of reasons. In the case of prescription drugs, this may be under the supervision of a physician. Other women may be using substances to help them cope with psychosocial stressors in her life. In some situations, women may deny use of these substances, but there are warning signs friends and family members can look for. The woman may go through many stages when admitting they are taking drugs. The Stages of Change model developed by Prochaska and DiClemente (1992) is one approach to understanding the steps to changing substance use during pregnancy. The woman is not considering change during the pre-contemplation stage. She may not believe it is necessary (examples: used during last pregnancy and nothing happened, or her mother used while pregnant with her and she is okay). She may not know or understand the risks involved. She has tried many times to quit without success, so she has given up and doesn’t want to try again. She has gone through withdrawal before and is fearful of the process or effects on her body. She feels strongly that no one should tell her what to do with her body. She has mental illness or developmental delay and does not have a good grasp of what using drugs and alcohol during pregnancy means—even when information is given to her. She has family members or a partner, whom she depends on, who use. She may not contemplate changing when everyone else continues to use. The woman in pre-contemplation may present as resistant, reluctant, resigned, or rationalizing. Family Response: Work with the resistance. Avoid confrontation and try to solicit her view of the situation. Ask her what concerns her about her use and ask permission to share what you know, and then ask her opinion of the information. Accept that this process of change is a gradual one, and it may require several conversations before she feels safe discussing her real fears. This often leads to a reduced level of resistance and allows for a more open dialogue. Try to accept her autonomy but make it clear that you would like to help her quit or reduce her use if she is willing. Family Response: Empathize with the real or possible results of changing. It is possible to give strong advice to change and still be empathetic to possible negative outcomes to changing. Guide her problem solving. Family Response: Instill hope; explore barriers to change. Family Response: Decrease discussion. Listen rather than respond to the rationalization. Respond to her by empathizing and reframing her comments to address the conflict of wanting a healthy baby and not knowing whether “using” is really causing harm. The woman is ambivalent about changing her behavior. She can think of the positive reasons to change but also is very aware of the negative sides of change. Family Response: Family and friends can share information on the health benefits of changing for the woman and foetus. The woman in contemplation will hear these benefits, and is very aware of the negative aspects of change on her life. Help her explore goals for a healthy pregnancy, and problem solve how to deal with the negative aspects of quitting alcohol and drug use and remaining abstinent. The woman’s ambivalence is shifting toward changing her behavior. She is exploring options to assist her process. She may be experimenting by cutting down or has been able to quit for one or more days. Although her ambivalence is lessening, it is still present and may increase when she is challenged by those around her, triggered by the environment, or is under other types of stress she has handled by using in the past. Family Response: Acknowledge strengths, anticipate problems and pitfalls to changing, and assist the woman in generating her own plan for obtaining abstinence. Problem solve with her regarding barriers to success. Work on plans for referral to treatment. The woman has stopped using drugs and/or alcohol. Family Response: Acknowledge her success and how she is helping her infant and herself; have her share how she has succeeded and how she is coping with the challenges of not using. Offer to be available for assistance if she feels that she wants to use drugs/alcohol again. Provide assistance with treatment referrals: Discuss triggers and social pressures that may lead to relapse, and help the woman plan for them. The woman may relapse; incidence of relapse for those who are abusing or addicted is high. Family Response: If relapse has occurred, guide the woman toward identifying what steps she used to quit before. Offer hope and encouragement, allow the woman to explore the negative side of quitting and what she can do to deal with those issues. (How did she deal with those issues in the past? Explore what worked and what didn’t work for her.) Offer to provide assistance in finding resources to help her return to abstinence. Chronic heroin abuse is associated with an increased risk of fetal growth restriction, abruption placentae, fetal death, preterm labor, and intrauterine passage of meconium. These effects may be related to the repeated exposure of the fetus to opioid withdrawal and the effects of withdrawal on placental function and may also occur in other types of opioid abuse. First-trimester use of codeine has been associated with congenital heart defects in three of four case-control studies. No association has been described between the use of other opioids during pregnancy and an increased rate of birth defects. The lifestyle issues associated with illicit drug use put a pregnant woman at risk of engaging in activities such as prostitution, theft, or violence, to support herself and her addiction. The consequences of these activities pose a host of risks to the fetus. Occurs when newborns of opioid-abusing mothers are withdrawn from narcotic exposure. NAS usually manifests within hours to weeks of birth, when the child is separated from opioids in the mother’s body. Symptoms of NAS include hyperactivity of the central and autonomic nervous systems, uncoordinated sucking reflexes leading to poor feeding, increased irritability, and high-pitched crying. Long-term data for children with in-utero narcotic exposure is limited, but studies have not found significant decreases in cognitive development with maternal opioid abuse. A urine drug screen is the single most useful test to determine if someone is abusing controlled substances. Before pregnancy and in early pregnancy, all women should be routinely asked about their use of alcohol and drugs, including prescription drugs. The patient should be informed that such questions are asked of all pregnant women to ensure they receive appropriate care and that all information will be kept confidential. Maintaining a caring and nonjudgmental approach will yield the most inclusive disclosure. Pressuring behaviors in the office, such as pleading for another prescription, excessively complimenting the prescribing practitioner, or threatening harm to self or others. Parents: Did any of your parents have a problem with alcohol or drug use? Partner: Does your partner have a problem with alcohol or drug use? Past: In the past, have you had difficulties in your life because of alcohol or other drugs, including prescription medications? Present: In the past month, have you drunk any alcohol or used other drugs? Any “yes” should trigger further assessment. Car: Have you ever ridden in a car driven by someone (including yourself) who was high or had been using alcohol or drugs? Relax: Do you ever use alcohol or drugs to relax, feel better about yourself, or fit in? Alone: Do you ever use alcohol or drugs while you are by yourself or alone? Forget: Do you ever forget things you did while using alcohol or drugs? Family: Do your family or friends ever tell you that you should cut down on your drinking or drug use? Trouble: Have you ever gotten in trouble while you were using alcohol or drugs? Two or more “yes” answers should trigger further assessment. In the past six months, have you taken any medications to help you calm down, keep from getting nervous or upset, raise your spirits, or make you feel better? Have you been taking any medication to help you sleep? Have you been using alcohol for this purpose? Have you ever taken a medication to help you with a drug or alcohol problem? Have you ever taken a medication for a nervous stomach? Have you ever taken a medication to give you more energy or to cut down on your appetite? Have you ever taken over-the-counter cold preparations other than when you have had cold symptoms? Do you take over-the-counter diet pills? Positive answers to any of these questions warrant further investigation. Look up each patient in E-FORSCE, Florida’s prescription drug monitoring program, to help determine if she is receiving controlled substances from other practitioners. E-FORSCE login. Do not use naloxone to diagnose opioid dependence in pregnancy women as opioid withdrawal may precipitate preterm labor or fetal distress. Pseudoaddiction is a situation in which a patient’s legitimate chronic pain is undertreated with pain medication, leading the patient to act in a way that resembles addictive behavior. This condition usually arises when a clinician is reluctant to prescribe enough of a controlled drug to provide adequate symptom relief. It is important to carefully distinguish pseudoaddiction from true substance abuse. Comprehensive prenatal care and monitoring, chemical dependency counseling, and other psychosocial services for women with opioid dependence should be a part of any treatment plan. The rationale for opioid-assisted therapy during pregnancy is to prevent complications of illicit opioid use and opioid withdrawal, encourage prenatal care and drug treatment, reduce criminal activity, and avoid risks to the patient of associating with a drug culture. Comprehensive opioid-assisted therapy that includes prenatal care has been shown to reduce the risk of obstetric complications. Perinatal methadone dosages are managed by addiction treatment specialists within registered methadone treatment programs. A list of local treatment programs can be found at the federal Substance Abuse and Mental Health Services Administration. The severity of NAS does not appear to differ based on the maternal dosage of methadone treatment. Buprenorphine is the only opioid which may be legally prescribed for the treatment of opioid dependence in an office-based setting. Physicians wishing to prescribe this medication must undergo specific credentialing. Advantages over methadone include a lower risk of overdose, fewer drug interactions, the ability to be treated on an outpatient basis without the need for daily visits to a methadone clinic, and evidence of less severe NAS. Disadvantages to buprenorphine include reports of hepatic dysfunction, lack of long-term data on infant and child effects, a clinically important patient dropout rate due to dissatisfaction with the drug, a more difficult induction with the potential risk of precipitated withdrawal, and an increased risk of diversion. The drug is available as a single agent or combined with naloxone, but the single agent is recommended during pregnancy. Although the single agent has a higher risk of abuse, it also has a reduced risk of exposing the fetus to naloxone which could lead to dangerous withdrawal symptoms. Not recommended because of its association with high relapse rates. If this is to be undertaken, however, supervised withdrawal should ideally occur during the second trimester and with the aid of a perinatal addiction specialist. If the only alternative to medically-supervised withdrawal is continued illicit drug use, the withdrawal should take place as soon as possible no matter the trimester. Breastfeeding should be encouraged in both methadone and buprenorphine patients as minimal levels of these drugs are found in breast milk. These guidelines are adapted from the American College of Obstetricians and Gynecologists’ Committee Opinion Number 524: Opioid Abuse, Dependence, and Addiction in Pregnancy and UpToDate’s Prescription Drug Abuse and Addiction: Prevention, Identification, and Management. Center for Substance Abuse Treatment Substance Abuse Treatment: Addressing the Specific Needs of Women. Treatment Improvement Protocol (TIP) Series, No. 51. HHS Publication No. (SMA) 14-4426. Rockville, MD: Substance Abuse and Mental Health Services Administration, 2009. Seeking Safety, Treatment Innovations, a Seeking Safety Evidence Based Treatment Model. We offer training, consultation, resources, research, and materials for Seeking Safety and other models. Treating for Two, Centers for Disease Control and Prevention. Treating for Two aims to improve the health of women and babies by working to identify the safest treatment options for the management of common conditions before and during pregnancy. The Florida Certification Board's Online Education Platform. Courses below are available under "Treatment: Special Populations." This 4-module course is designed for staff working in substance abuse treatment settings as well as staff from other allied fields who serve women who may be affected by problem substance use. Five (5) continuing education credits or contact/clock hours are available upon completion. Moms’ Mental Health Matters - The Eunice Kennedy Shriver National Institute of Child Health and Human Development (NICHD), part of the National Institutes of Health (NIH), has launched Moms’ Mental Health Matters, a new initiative to raise awareness among pregnant and postpartum mothers, their families, and health care providers about depression and anxiety during pregnancy and after the baby is born. CDC Study Highlights Economic Burden Created by Opioid Overdose and Abuse - Prescription opioid overdose, abuse, and dependence cost the U.S. $78.5 billion in 2013, according to a study released in the journal Medical Care. Healthcare spending and substance abuse treatment alone accounted for over a third of the cost ($29 billion). Articles, reports and other useful information. Claims study quantifies growing impact of opioid crisis - Commercial health insurers paid treatment centers and other providers $445.7 million to treat plan members’ opioid dependence and abuse in 2015, demonstrating a 1,375% spending increase over five years. Well-meaning friends fuel pain-drug misuse - SAMHSA's National Survey on Drug Use and Health collected data on the misuse of prescription products and found that 53.7% of those who reported misuse of pain drugs said they got them from a friend or relative. Experiences of Mothers of Infants with Neonatal Abstinence Syndrome in the Neonatal Intensive Care Unit, Journal of Obstetric, Gynecologic & Neonatal Nursing Cleveland, L.M. and Bonugli, R. (May-June 2014), Volume 43, Issue 3, pages 318-329. Let’s Talk Attachment How Does Substance Use Impact the Parent-Child Relationship? Let's Talk Attachment: How Does Substance Use Impact the Parent-Child Relationship? Harvard Health: Misconceptions around Addiction - For Recovery Month, Dr. Michael Bierer, an Assistant Professor of Medicine at Harvard Medical School and Addiction Specialist, shared the video below in which he discusses the many misconceptions surrounding addiction. SBIRT (Screening, Brief Intervention, and Referral to Treatment) Videos. These videos demonstrate aspects of SBIRT. In most, health care practitioners practice the BNI (Brief Negotiated Interview) with patients who present with various health concerns related to their substance use. The following maps are provided to help you find treatment in your local areas.